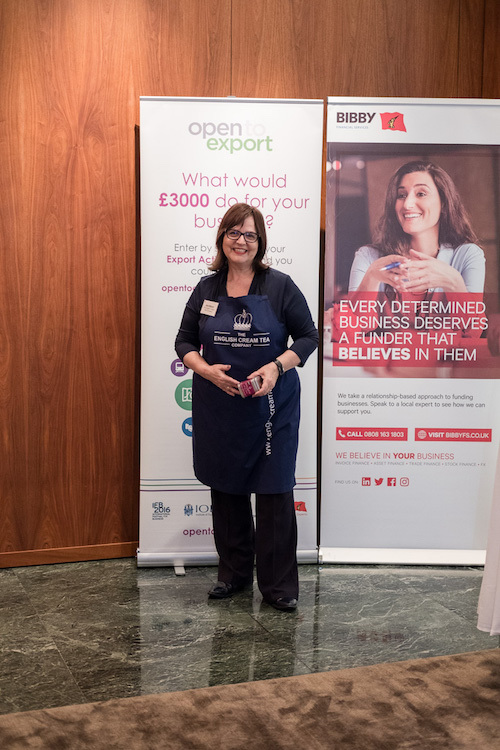 In the latest of our exporter case studies following the recent Export Action Plan competition final, we talk to Jane Malyon, the Chief Scone Gnome at The English Cream Tea Company. The English Cream Tea Company delivers afternoon tea hampers all over the UK. Deliciousness which arrives chilled, but also for shops and customers abroad we do ambient and long lasting gift tins, teas, jams, tea towels, all around the traditions of English afternoon tea and cream tea treats. Where The English Cream Tea Company at the moment in terms of exports? We’ve got a little in Switzerland, a little in Germany, lots in Portugal, and most of all in America – so far. How has the Action Plan helped? It’s really good to be able to focus for a bit, because we get so busy in doing things, fulfilling orders and hurtling around. With something like the Action Plan you actually have to take time out. We did it as a team as well and it was a great opportunity to sit together, discuss and focus. It was a great focusing avenue for us and a pause in the usual franticness to say exporting is serious, this is where our potential lies. We enjoyed the opportunity to plan things out – you know they say ‘fail to prepare, prepare to fail’. It was like putting blinkers on and saying ‘come on, what’s the best thing for us’. In terms of Brexit, how are you feeling about it? I’m actually positive – it could be great for us. I feel that for idiosyncratically British companies, things like afternoon tea are treasured the world over. If you go into the Savoy or the Ritz it’s full of Chinese and Japanese people enjoying it and it’s honoured everywhere you go in the world. I only see that as being enhanced by Brexit, unless countries get cross with us. I can see them treasuring essentially British produce even more than before. I’m hoping there’ll be a way forward to keep everybody comfortable with exporting, wherever it is – Europe as well. I’m determined to make it work and if I can’t go into a particular market for a while then I will look at other ones. And a couple of quick-fire questions, how do you say scone? Both are technically correct. Her Majesty says scone as though it rhymes with gone, but we like to say she’s wrong because we have a special bright red, old-fashioned telephone for our orders and it’s our ‘scone phone’. You just can’t have a scon phon! Jam on top? Or cream top? Cream on top is the Cornish way; Devon says it’s cream underneath because you wouldn’t put butter on top of your marmalade – the dairy goes first. Cornwall says if it’s a warm scone you must have the jam on first to protect the cream from melting and the cream’s the crowning glory and should be on top. I’m from Essex and I eat it anyway I feel like.